You know I don't think I posted my news on here, because I didn't think about sharing it with you. I am pregnant, or as my friend Rebecca pointed out, Queens Foodie Mama has a bun in the oven. We are having a baby girl, due January 6. My children are super excited. Remember when I made California Rolls? Well I wanted to make sushi rolls again but not with shrimp and of course not with raw salmon. I'm sure my OB-GYN would gladly remind me to avoid raw meat/poultry/fish of any kind, so raw salmon was out. 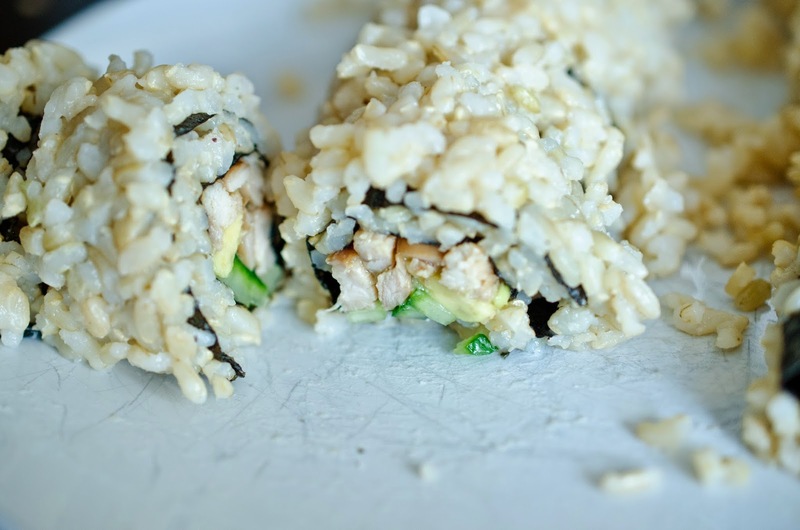 While researching recipes for sushi rolls, I came upon Unagi Rolls. Unagi is grilled/barbequed fresh water eel. Eel didn't really appeal to me, so I looked up what people said eel tasted like and some people mentioned it tasted like chicken. My brain immediately decided why not do a sushi roll with chicken instead. Next I looked up what Japanese barbecued chicken was called and also a recipe for the barbeque sauce and that is when I chose the name, Yakitory, meaning grilled chicken. I tend to volunteer to take dinner to every woman who has just had a baby and her family in our church so the Yakitory Rolls were going to be for both my family and the Havig's who I was told by my friend Whitney loved sushi. This recipe is dedicated to Kara and baby Heidi. Japanese chef either. These are still really tasty. for 20 minutes on the counter. I cooked the chicken in my rotisserie for 20 minutes, you could also grill the chicken. cooker which is so much easier to use. 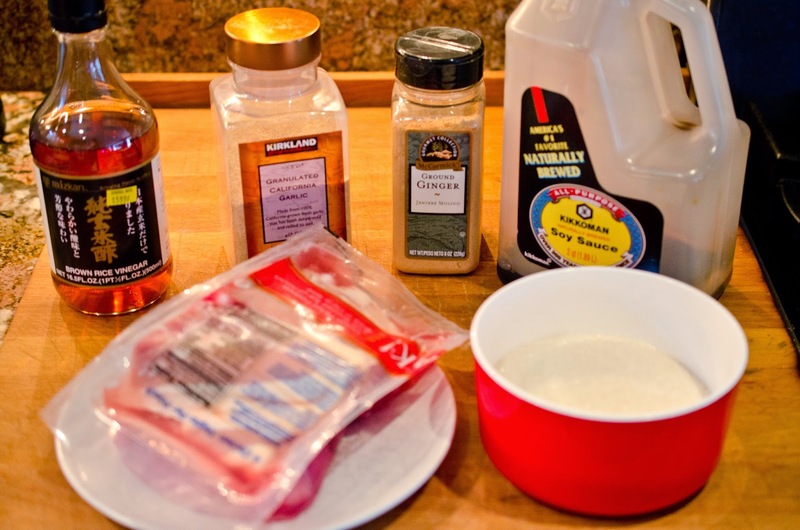 Mix vinegar, sugar, and salt together. 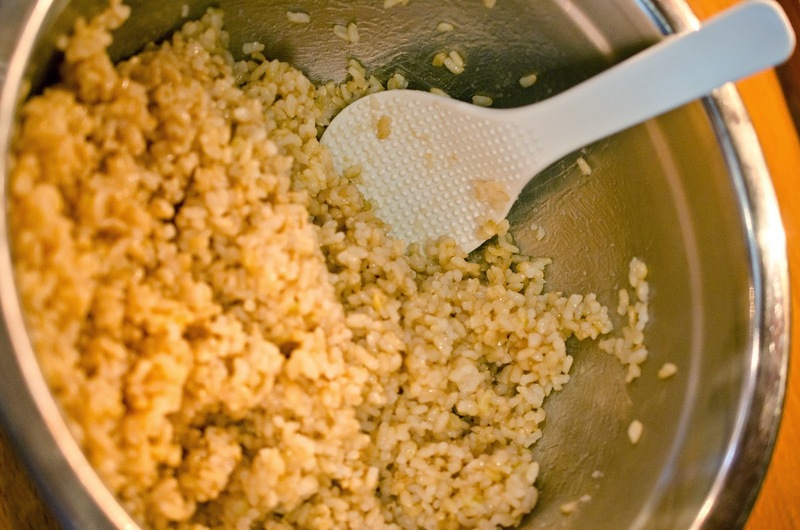 Add vinegar mixture to still warm rice, stir until combined. skin on across the grain. 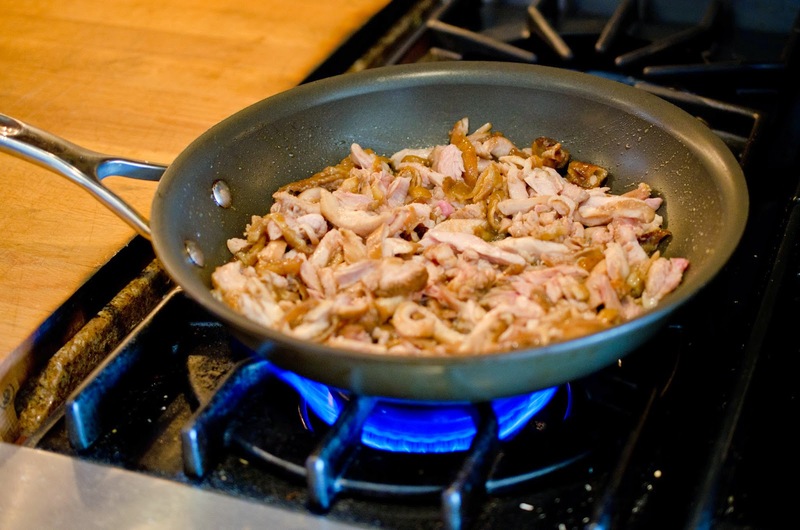 Sauté sliced chicken over medium heat until slightly crispy on edges. scoop out with a large spoon. 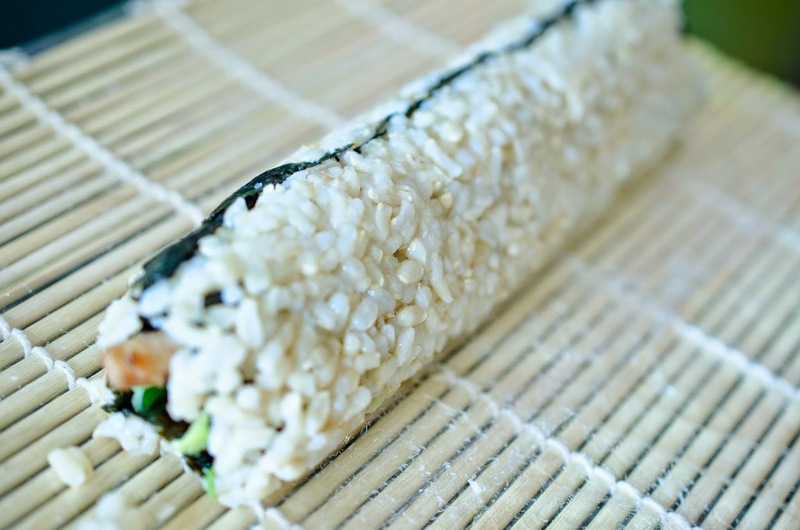 Cover bamboo sushi mat in plastic wrap. Place nori sheet in the middle of the mat. 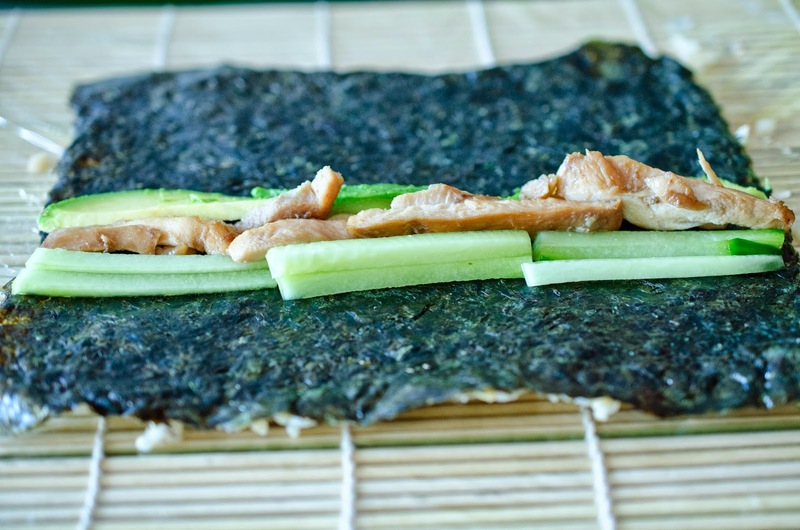 Scoop out a baseball size mound of brown sushi rice onto the nori sheet. With wet fingers spread out the rice, cover all but the top small edge of the sheet. 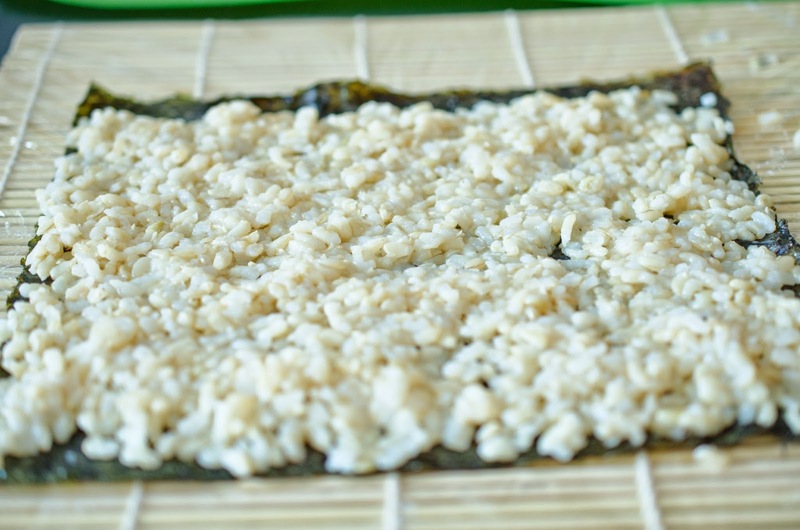 Flip nori sheet so rice is on the backside. slices of avocado to the cucumber. Finally add strips of chicken. 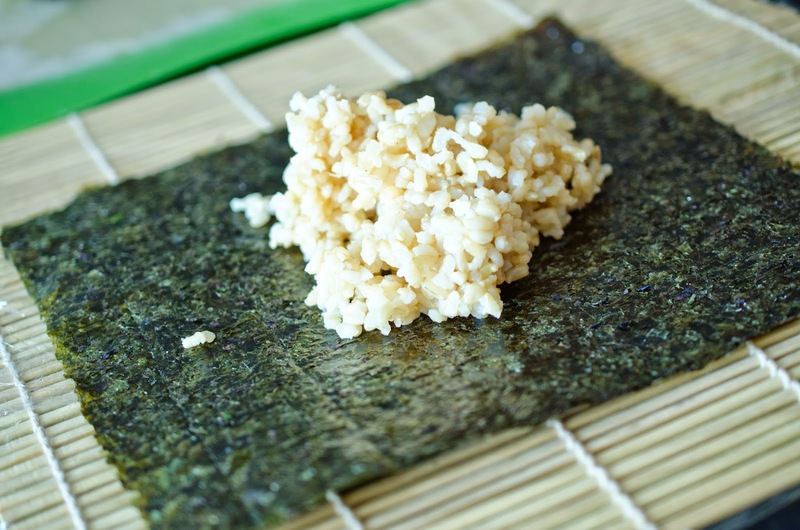 Using the mat roll the rice covered nori sheet, carefully keep the other ingredients inside the nori sheet. into 1 1/2 inch thick slices. 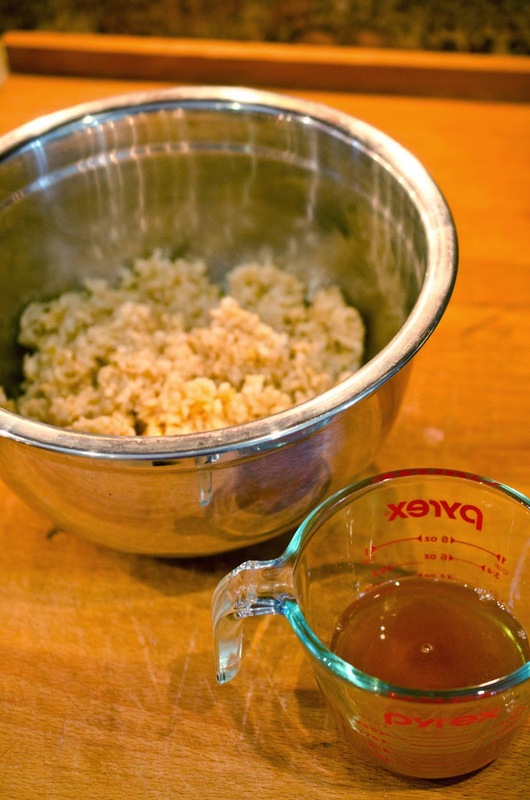 Pour soy sauce, and brown rice vinegar into a small sauce pan. Add sugar, garlic, and ginger to sauce. 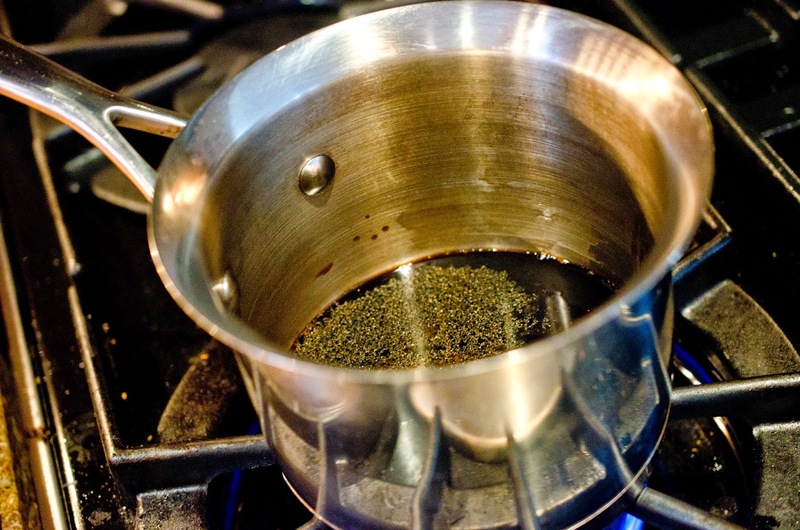 Cook over medium heat until it boils and reduce heat to low. Cook on low for 5 minutes. 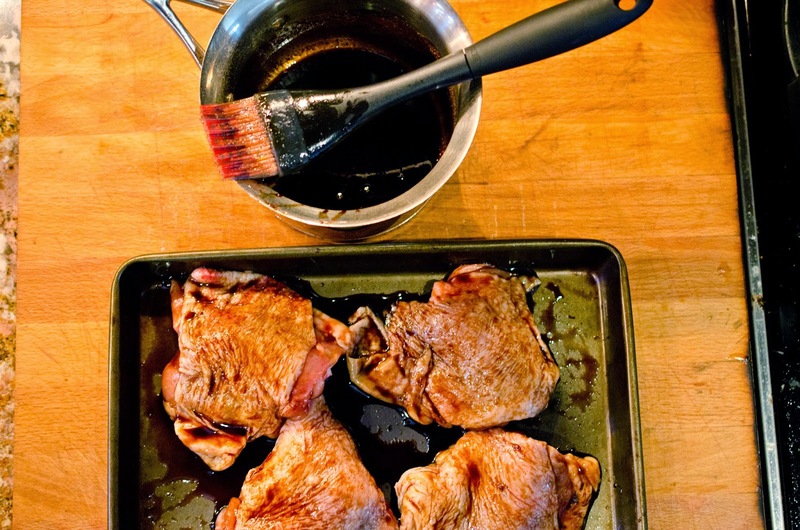 Brush sauce onto thighs, on the skin and under the skin. Brush all over. Allow to marinate for 20 minutes on the counter. Cook the chicken in a rotisserie for 20 minutes, or you could also grill the chicken. Cook the rice on the stove according to directions on bag or do what I do and use a rice cooker which is so much easier to use. 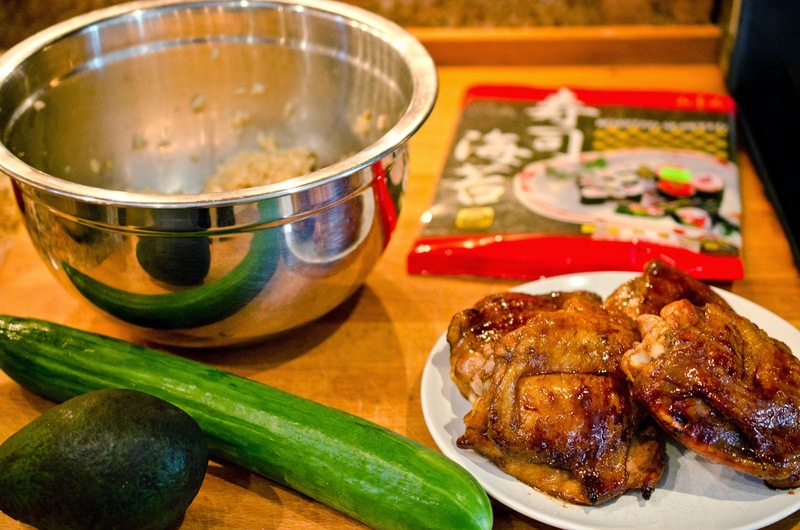 Remove bones from chicken thighs, trying to keep the thigh intact. 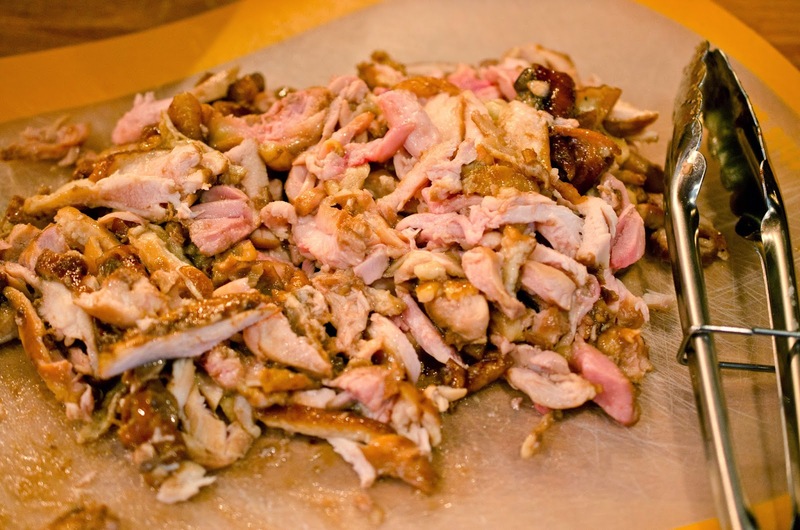 Thinly slice chicken with skin on across the grain. Julienne cucumber into small matchsticks. Slice half the avocado lengthwise in skin and scoop out with a large spoon. Place nine cucumber sticks, three in a row and three deep on the middle of the sheet. 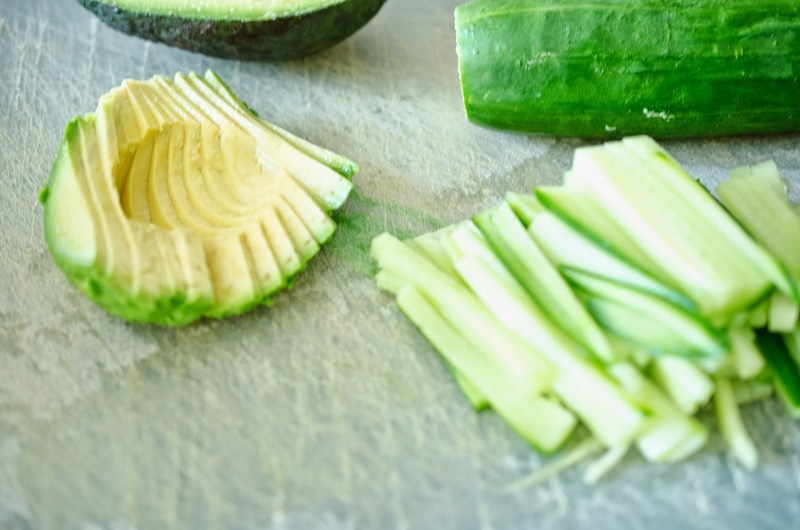 Add 3 slices of avocado to cucumber. Finally add strips of chicken. Repeat with all the rice and other ingredients. Cut the rolls using a serrated knife in the slow sawing motion. Dip the knife in water between each cut to prevent sticking. Slice rolls into 1 1/2 inch thick slices.